All of the following events are real. The names had been changed but then changed back again because there was no reason to change them in the first place. And because I'm too lazy to sit down and write a compelling narrative they are in plain-old-boring chronological order. At 3:45 AM on Christmas Eve I woke up and decided to have breakfast as going to sleep would be fruitless because Staci, Miloh and I needed to be out the door at 5:00 AM for a 7:30 AM flight to El Pueblo de Nuestra Señora la Reina de los Ángeles del Río de Porciúncula... now known as Los Angeles. There was some fantastic snow on the ground which would be great for boarding but would slow down a drive to the airport. But we knew we'd be good with two and a half hours of time. Then we realized we only had two hours because our flight took off at 7:00 AM. We got to the airport in great time... which made me happy. Then I was hit with a startling realization. I had gone from a guy who could fly through a Black Diamond expert lane in an airport to a guy who could barely get through. I realize the idea that I can fly through a lane contradicts my post about my probs with airports in the past... but when not being hassled I could fly through. Going through the metal detector I had my first misstep (if you don't count having to pass Miloh back and forth to Staci three times while we got our stuff in the grey tubs) I forgot to take my metal card case out of my pocket... I threw it on the conveyor belt, it went in my grey tub and all was good. Then I had to get my stuff back in my bag and such. No help this time as Staci was in another lane with the formula and bottles and stuff while I took Miloh. I did what anyone would do... I put Miloh on the last grey bucket in the conveyor belt, put my laptop in my bag, got my shoes on and started to put my belt on. That's when the TSA woman said (in kind of a weird way) "he's cute". Then she stared at me and mumbled. Next she said something about him being in the tub and I said "yeah." And she said "you need to take him out of the tub" followed by "obviously we can't use the conveyor belt with a baby in a tub" to which I replied "not obviously." I got silence... so I said "because if it was obvious I wouldn't have him on". I felt I needed to explain myself. Maybe it was that I was super tired... but really I think it was because I was leaning against Miloh and watching that none of the grey tubs knocked him. But who cares (seriously why are you reading still?) I made it through the line without any scuffle. We got to the gate, a bit late, and got situated in the last row of the plane but we had an extra seat which was golden. That's when the panic set in. Would we be that family with "That Kid"? We'd been on a plane before and Miloh was awesome. But Miloh was only four months old then so we weren't sure if his calmness would still be around... especially because he's a ball of energy. Luckily he was fantastic, he slept in my arms the whole time. First stop was to see some of our old friends, Jody and Ethan and their two kids Kai and Maya. We only had a bit to say hi to them as we were headed to Santa Barbara to hang with Staci's sister for a few. 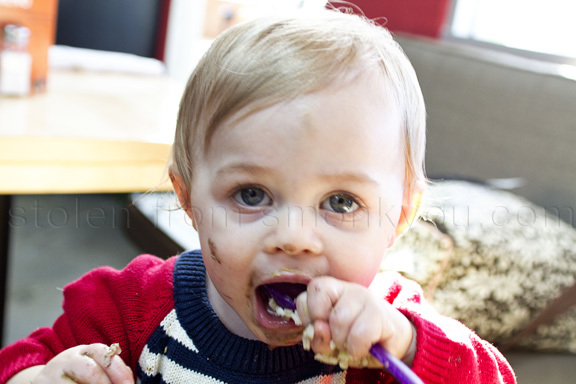 We went to a Mexican place and had a mini revolution: Miloh loves guacamole. Totally freaking loves it. We never even thought to give it to him... he loves Avocados and we've had guac around... but it never crossed are mind to feed him guac. After the guac fest we drove up north a bit. Somewhere in between we stopped at a gas station and saw a woman, in a fully armored motorcycle jacket and a full-face helmet, with a small dog in a backpack... on a motorcycle. That has nothing to do with anything, but WTFuck? When we got to Staci's sister's house it was good times. Miloh one of his aunts, her boyfriend and one of his (Miloh's) cousins. He was exhausted and slept like, well... a baby. Yeah this is getting long but here's the Cliffs Notes of that stop. Miloh was super happy there... he talked up a storm... way more than he does at home. 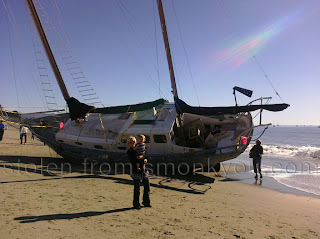 He got to see the the beach and his first ship wreck... seriously a ship wreck... how many of those have you seen? He also crawled in the sand for the first time. He crawls so fast that he looked like an alien from the movie "Aliens" when he was on the go. I'd have said the movie "Alien" but if I recall correctly there's only the one alien in that and it's big. In "Aliens" I think there was a lot of small aliens... that's what he looks like, except with less teeth. After some awesome days in Santa Barbara we headed back to The Valley. He was loving playing with his new buddies, Maya and Kai. The next morning we all headed to Disneyland. As a little aside some friends have asked me if I'd ever movie to L.A. The answer is always yes. And then I get on the highway. I can't stand L.A. traffic. I'm an aggressive driver and I think the folks out there are complete assholes... and that's really odd as usually the pace of life is slow. Have you ever seen the movie "Falling Down"? That's how I feel any time I'm in traffic there. Then we got to the Happiest Place on Earth. Not really sure why they call it that. For the first 20 minutes I wanted to punch people... and I'm not a violent person at all. But a combo of the traffic, the crowd and a bunch of idiots made me a bit bitchy. However I will add a bit of a spoiler and say we wound up having a great, perhaps magical, time there... but still the Happiest Place on Earth shouldn't leave you with clenched fists in for the first 20 minutes. At Disneyland Miloh saw the Winnie the Pooh, Eeyore and Tigger. He put his arm out and said "pblpptbtht" which is his word for dog or cat (or maybe just animal.) He's too young to know them and I've only read one story to him so it was really cool to see his eyes light up at them. Anyway the day wound up great and we all headed back home. The next day was a bit epic. We met The818 in the 818. Morgan is one of the first blog/twitter people I started talking to after I started this blog so it was awesome to meet her. In her post about said meeting she mentioned how it's weird meeting internet folk... and it is. She said I could have been a Ted Bundy, and I was totally thinking that. I could be some crazy dude who made up a wife and kid to meet people. It would be pretty crazy, but I'm sure it happens. Afterwards we had a little bubble tea, went out with our friends for an adult dinner and the next day we headed back home. Again Miloh was fantastic on the plane. So yeah, it was a good vacation. Miloh got his first set of wings. I finally found a pair of sunglasses that fixed my pea-head. Arak is a great drink (we were warned 3 times to drink it with food). Disneyland should have a vasectomyland. That blue Halo Mountain Dew is pretty good. Congrats to my nephew who got into Vancouver Film School. The whole right side of a Chevy Impala is a blind spot. Miloh hated car seats in California. This post was one long ramble. I'm amazed that this post has no comments. I totally loved it. Maybe I'm just deliriously tired but I was laughing quietly to myself (so as not to wake up any sleeping littles) just about the whole way through. Glad you made it through your vacation okay - I can not even imagine taking a baby to Disney. I think I would have a nervous breakdown. BTW: I've been following for awhile but I started a new Mommy blog this month. I'd love it if you popped in when you get a chance!